The 2012 tour featuring the B-52s and Squeeze is aptly named the Summer Dance Party. On July 10, 2012 the two bands brought their up-beat energy to the Mayo Performing Arts Center in Morristown, New Jersey. Each act played engaging sets showcasing their major hits and some newer material that had fans on their feet for most of the night. 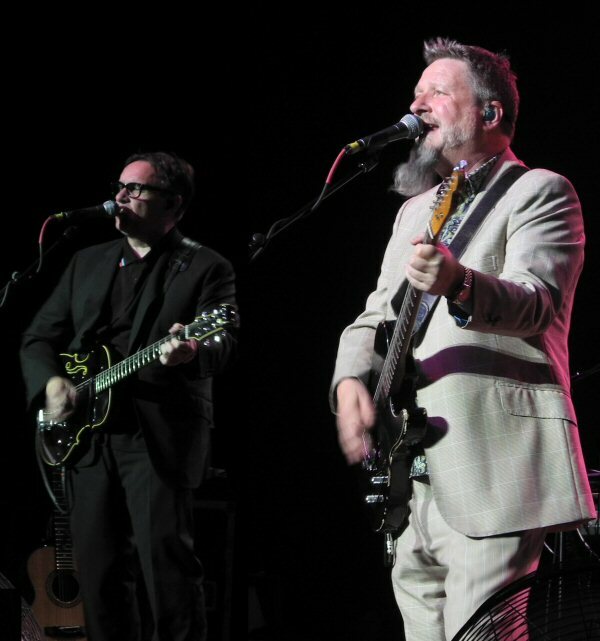 Chris Difford and Glenn Tilbrook at the Mayo Arts Center in Morristown, NJ. In 1982, Squeeze sang "I've Returned" on their Sweets From a Stranger album. A quarter of a century later the band really did return in 2007 with their most stable line-up to date for repeated tours in their strongholds in the States and British Isles. While their concerts in this time frame have been mostly a run through of their biggest hits, fan favorites and the occasional rarity to keep the diehards happy - their current tour is finally showcasing new material - perhaps some of the numbers that will appear on their much-anticipated new release slated for 2013. Squeeze took the stage shortly after 8 p.m. drawing the opening slot on this edition of the co-headlining bill. As the crowd took their seats the band opened with the energetic "Take Me I'm Yours" followed by the much loved "If I Didn't Love You". Frontman, singer and lead guitarist Glenn Tilbrook greeted the crowd as the band moved into a spirited "In Quintessence" with a concise solo that was brisk and breath-taking. The highlight of the evening were the three new songs performed for the Morristown fans. First up was "Tommy" - a slower and orchestrated number about a nasty character who is a racist drunk. "Top Of The Form" soon followed and this one might become a new anthem for Squeeze who is very much there at the top in recent times. "Honey Trap" was the third and final of the new trio of songs about sweet temptation. Throughout the evening the sharply-dressed 5-piece delivered their quality content in business-like fashion. A series of animated clips and photographs flashed on the screen to help document the band's history with a bit of nostalgia and humor. Squeeze is a fantastic band who plays their songs in a live setting pretty close to the originals. However, there are often stunning breakdowns, codas and intros that reveal the boys to be more than just your average purveyors of pop. At times they border on jam-band sensibilities. On this night Tilbrook offered nuanced changes in inflections on a few numbers - perhaps to keep the songs fresh to him and the fans in attendance. Squeeze wrapped up their main set with the always alluring "Tempted" and closed out the show with a bouncy and caffeinated version of "Black Coffee in Bed". The fine dose of music from the openers got the crowd up and buzzing before handing things over to their dance partners. 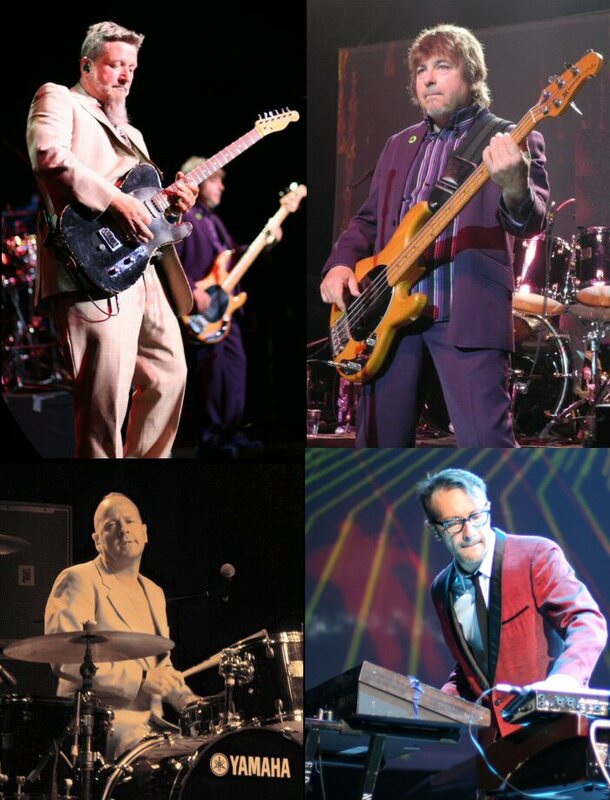 Squeeze at the MayoPAC - pictured are Glenn Tilbrook, John Bentley, Simon Hanson and Stephen Large! This is the fourth time we've seen Squeeze live now since they returned from their self-imposed sabbatical in the late 90's. As long-time supporters of the band this incarnation is a different animal mainly because the stability of this unit has forged the tightest version of the band since their earliest days in England. It's exciting to realize that Squeeze will soon transform into more than a nostalgia offering once their new album hits the shelves and reminds the listening public why Difford and Tilbrook were often called the new Lennon and McCartney. Thirty plus years after their inception in Athens, Georgia the B-52s are still a popular party band! Their unique bubbly blend of new wave, pop-rock with an edge of punk has kept fans on their feet for years. The B-52s have sold millions of albums and have a list of hits to their credit including "Rock Lobster", "52 Girls", "Private Idaho", "Give Me Back My Man", "Strobe Light", "Summer of Love", "Wig", "Love Shack" and "Roam". In 2008, the B-52s released Funplex their first new record in 16 years. The aptly titled album featured the classic yet contemporary B-52s sound enhanced by rocking guitar riffs and driving drums. Newsweek Magazine declared, "Like a sonic shot of vitamin B12, the dance floor beats, fuzzy guitar riffs and happy, shiny lyrics keep the energy going." The B-52s (l to r) are Keith Strickland, Cindy Wilson, Fred Schneider and Kate Pierson. 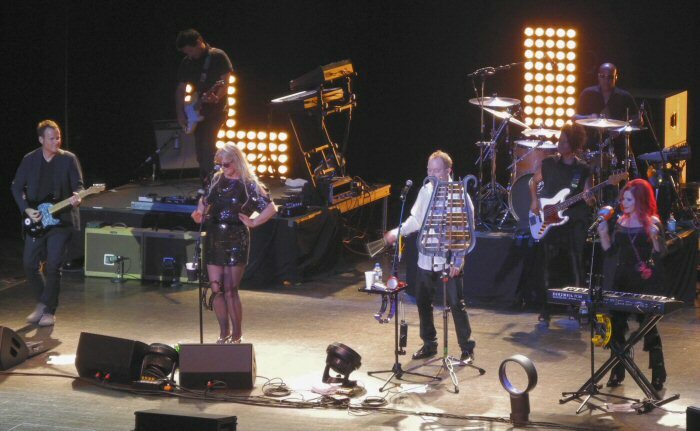 On Tuesday, the B-52s took the stage second and their set up in contrast to Squeeze's was more open although they used an array of instruments. The core four of Fred Schneider, Keith Strickland, Kate Pierson and Cindy Wilson were backed by an able band which included Sterling Campbell on drums, Paul Gordon on keys & guitar and Tracy Wormworth on bass. Many people were on their feet as the B-52s started with a sizzling "Hot Corner" enhanced by the use of lights. The tune was heavy on rhythms and their signature singing exchanges. "Hello Morristown and New Jersey," greeted the band as they moved into "Mesopotamia" also thick with beats and beguiling back and forth vocalizations. "Let's go to Idaho" introduced "Private Idaho". The song had punch and the lyrics are still intriguing. "Hot Lava" also flowed on bold beats and vocal blends. "Give Me Back My Man" melded up-tempo grooves with the cow bell demonstrating that the night's live performance was well mixed where subtle sounds could be picked up. The B-52s mentioned that the next song was new (2008) as they went into the title track from Funplex. The feisty tune had the classic B-52s sound with a catchy hook. "Let's take a hippie trip together," stated Kate as the B-52s performed a rocking version of "Roam". Lots of fans were on their feet and the use of bright colors and lights enhanced the already up-beat energy of the song. From there they moved into a giddy "52 Girls" and progressed into the future with "Love in the Year 3000" complete with robotics vocals and chunky rhythms. "Too Much to Think About" kept the dance pace up and went into the whimsical "Whammy Kiss". "Love Shack" was lively with fans clapping and singing along. The B-52s closed the set with a 'thank you' to the fans. They then returned for their encore, which was a combination of "Planet Claire", "Party Out Of Bounds" and "Rock Lobster". The mix ran the gamut from rapid rhythms to surf music and ended the concert on an elevated note. The B-52s are still a party band bringing lots of energy and enthusiasm to their live shows! The Mayo Performing Arts Center is in the heart of Morristown just up the street from the village green. The thriving downtown has plenty of history, restaurants, shopping and towering stone churches to make a day trip worthwhile. The recently revamped theater has solid acoustics and an impressive line-up of bands, comedians and companies continually added to the venue's schedule. So, put on your dancing shoes and make sure to check out the city and the MayoPAC for a guaranteed enjoyable evening out. 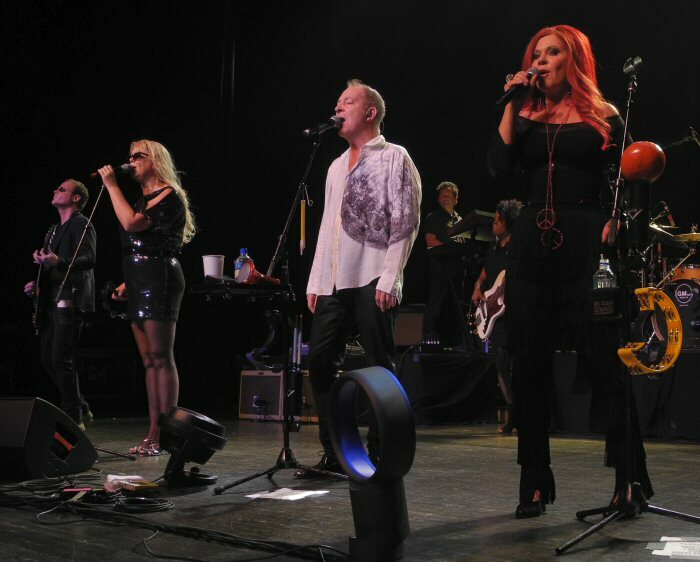 The B-52s on stage in Morristown, New Jersey.